Portable Homes Nigeria - Free Portable Prefab Homes Guide. Tips To Buy Cheap. 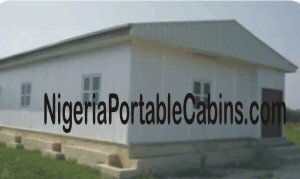 Portable Homes Nigeria - Free Portable Prefab Homes Guide. Free Tips And How To Buy Cheap. This site is all about portable homes and portable cabins. Let's start by answering the commonest question potential clients ask us when we talk about portable prefab homes. People frequently ask, "So, what's the difference between portable homes and portable cabins?" Portable prefab homes are prefabricated buildings constructed for use as residential buildings while portable cabins are prefab buildings that are designed to be transportable from one site to another. In simple words, portable cabins are transportable prefab accommodation while portable homes are more permanent prefab structures meant for use as residential property. Both are constructed from prefabricated sandwich panels. The difference is in the the purpose they are designed for. Remember that portable cabins (or portacabins) are meant to be transportable on our roads. Since, there is a maximum width of load allowed to be transported on our roads by law, this inevitable affects the maximum width and length a portacabin manufacturer can build a portacabin to. The maximum length a portacabin can be built to is 12 metres (or 40 feet). And the maximum width is 3.6 metres (or 11.8 feet). Actually, we recommend a maximum of 3 metres (or 9.8 feet) for portacabin width because of the impact a wider cabin usually have on transportation cost. You cannot order a portacabin that is bigger than 12 metres long by 3.6 metres wide. This restriction on transportable cabin size also means that any portable cabin you order will either be a rectangle or a square. For example, a portable cabin can be . . .
. . . and any size inbetween but no bigger than 12 metres by 3.6 metres. On the other hand, portable homes have no restriction on size . . . either in terms of length or width. And portable prefab homes don't have to be a rectangle or square. Portable prefab homes can be built to any size or shape the client wants just like any regular home. Here's another key difference between residential prefabricated homes and portable cabins. Most portacabins are built in the factory and transported to the client's site (or any location the client specifies in the order) whereas portable prefab homes are usually built at the client's site because they are usually too big to be transportable on our roads. Some clients sometimes ask, "I know portable cabins are transportable accommodation often used as portable office buildings but can I use a portable cabin as a portable residential home?" In fact, that is one way of our recommendations in our low cost prefab homes section. When portable prefab residential buildings are designed in a rectangle shape like portable cabins, the cost is significantly reduced. So, if you're on budget and want low cost prefab homes, we recommend you opt for portable prefab accommodation homes built like portacabins.